We’re not quite done pulling CultureLab together, but the semester has begun, and classes have begun to use the space! One of the wonderful things about museum spaces is how they change once they are full of people. Designers and curator, I think, tend to imagine spaces without people, pristine in their displays, objects on the stage, words there to be studied. It’s much harder to imagine a space full of people, each at least as interesting as any object on display. We know that we’re supposed to design for an audience, but it’s not always easy. The same is true of designing an interactive space. Students start using it, and you realize that it’s not just about space and things, but about procedures and policies, too. 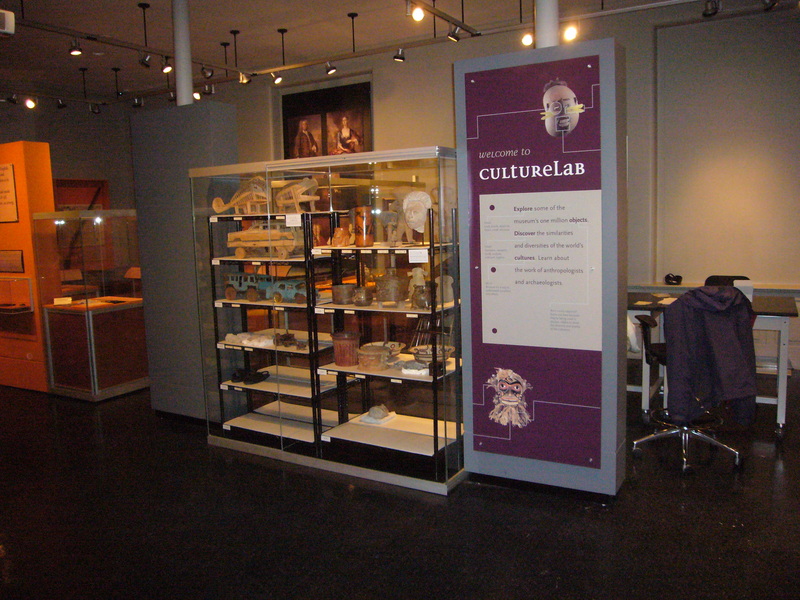 Most important, we’ve decided to have open hours for the CultureLab, and a staffer there when it’s open. We have a museum guard/greeter, who could handle some of this, but there are really two different jobs here. So (to start with). Tuesday through Friday, 1:00 to 3:00 we’ll have someone there to work with anyone coming in to look at objects. 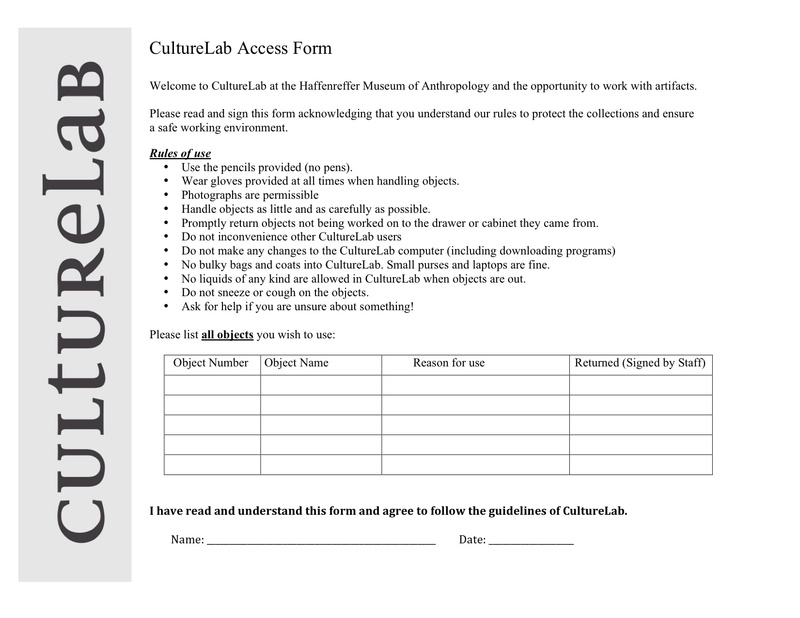 This not only lets us shape a more significant learning experience, but als0 lets us advertise the CultureLab as an ongoing event, rather than just an exhibition. And we’re been writing rules. Next a set of rules for handling objects. We’re still debating these. We’ve got a good set of rules, but perhaps so thorough that it won’t be read. How detailed should this be? We’ve made a determination about what objects can and can’t be handled – and we will indicate those which should not be touched, with a red star next to them, as a reminder. Know how to use the tools: microscope, etc. Know how to present the CL kits for general visitors. An interesting discussion ensued after the suggestion that CultureLab assistants wear lab coats. Some staff pointed out the practicality, when dealing with dusty objects. Others pointed out that lab coats can be impractical, could make you drop an object. But the biggest question: do we want to suggest that anthropology is a science? Might that upset some anthropologists? Might suggesting otherwise upset others? We decided not to go with the lab coats, at least for now. We also talked about evaluation of the CultureLab. Not sure how to do this – a questionnaire, a follow up email… More to come on this.